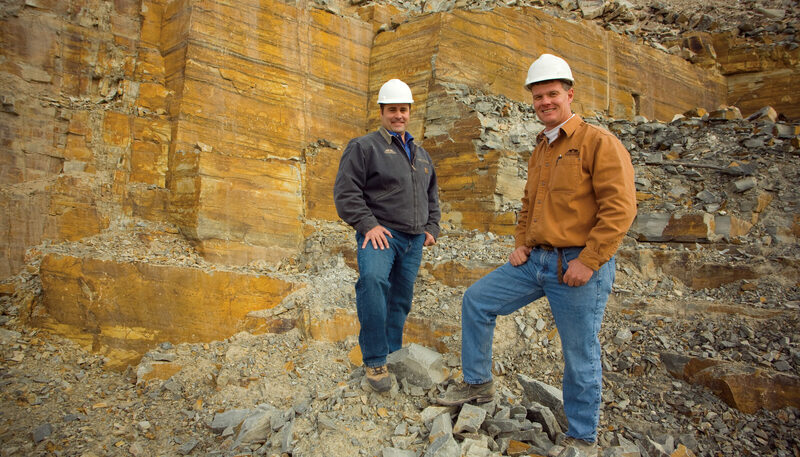 Owners Brad Mercord and Bill Carter founded Montana Rockworks, over two decades ago, when Brad’s thriving specialty-stone landscaping firm one day outpaced production capabilities at the local quarry, in the middle of an upscale project. In response, Brad and Bill bought the local quarry, upgraded it and got the job done; a habit of theirs. Brad, Bill and the team at Montana Rockworks quickly went on to be awarded as “Entrepreneurs of the Year” by the Montana SBA, in 2000, for their phenomenal success in the stone industry. With Bill and Brad meeting, personally, with clients interested in Montana Rockworks’ products and offering their industry expertise, Montana Rockworks quickly grew from meeting local demands for superior stone, to meeting international requests for a variety of projects. With the introduction of natural stone Thin Veneer in 2006, Montana Rockworks moved on to become a leader in the natural stone thin veneer industry. In 2017, they opened up a second Montana Rockworks location with a showroom and retail yard in Bozeman, Montana. Rockworks is continuing to revolutionize, elevate and expand the thin veneer, landscape and architectural stone industry. Homeowners, architects, landscape firms and designers, throughout North America, are using stone from Montana Rockworks as their building and landscaping material of choice. Rockworks has supplied stone for luxurious homes, mountaintop lodges, corporate getaways, museums, commercial centers and art projects nationwide. Stone is not all that is offered at Montana Rockworks, there is also a long history of rock solid reliability. Rockworks has focused on cultivating loyal, long-term relationships with clients over the years, supplying them with the stone they need. In addition, Montana Rockworks is connected to a national network of quarries, providing business partners with essential stone. For over a decade, Montana Rockworks has supplied clients with the oldest and most beautiful stone in the industry; stone that is found only here in Rockworks’, Montana quarries. Montana Rockworks’ Chief Cliff Series, which includes McGregor Lake, Castle Rock and Moose Mountain, is a regional argillite stone and is growing in popularity, nationwide. If building with stone provides a sense of permanence, then building with billion-year-old stone is eternal. Whether the look desired is the coveted “Mountain Mystique” or European Chalet; “Parkitecture” or Contemporary Asian influenced, Montana Rockworks will supply the project with superior stone quality, when needed and wherever the project may be. For thin veneer, masonry veneers, interior flooring, patio stone, landscape features, architectural accents or design focal points, Montana Rockworks offers unparalleled stone. » Bill Carter is the driving force of the Sales and Marketing Team. With a vast knowledge of stone, keen eye for design and get the job done approach, Bill is the key asset to the Montana Rockworks team. Bill is also currently servicing the Canada, Montana (outside Flathead Valley) and Idaho markets. » Tristan Taylor, a 12 year veteran of the team, is the go to gal for all of your marketing needs. As the sales manager/partner for the Midwest region, along with Alex Bienemann, she helps service the North Dakota, South Dakota, Minnesota, Wisconsin, Illinois, Ohio, Indiana, Michigan and surrounding areas. Tristan also project manages for the Bozeman-Gallatin Valley region and is the Operations Manager for our Montana Rockworks Bozeman Location. » Alex Bienemann is our Architectural extraordinaire servicing the Midwest Region, Colorado, New Mexico, Jackson WY and Bozeman/Gallatin Valley markets. Alex is also a manager-partner for Midwest Regional Sales, along with Tristan Taylor. » Brian Antes, with the sales team for 10 years now, is the project manager for all local Flathead Valley clients. » Beth McBride, also a 12 year veteran of the Montana Rockworks sales team, is the key player for Washington, Oregon, California Arizona, Utah and Texas.